The Illini Solar Car team has made a lot of progress over the past semester. Here are some of the highlights! We have built a mock driver compartment to help determine the best dimensions for multiple drivers. In order to construct a more competitive car, the mechanical team has decided to lower the frontal area of our car to achieve a higher aerodynamic efficiency. We have changed our initial main body airfoil and designed a frame chassis for FAE validation. With this new design the mechanical and aerodynamics team have been working together closely to optimize the body shell shape for maximum efficiency while still making sure that our car is visually striking. This semester the aerodynamics team has made great progress. New members are nearly ready to use OpenFOAM software on their own to run complex simulations. 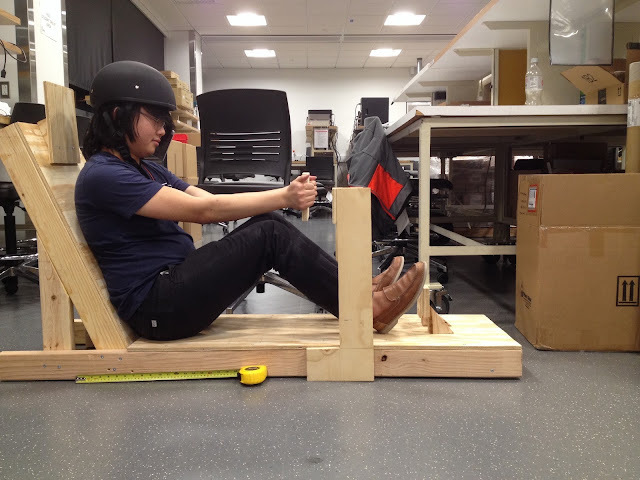 More experienced members have been working on improving the shape of our car for maximum efficiency. The benchmarking process is finished and recently, the team was able to run a full simulation of one potential shell shape. We are excited by the preliminary CFD results, showing a coefficient of drag value of just 0.07! The team will continue to test other potential shapes and improve the shapes as much as possible up until the construction of the car begins. Looking forward, the aerodynamics team aims to develop more sophisticated meshing processes to allow our simulations to run with less computational power in less time. We hope that this will also improve the accuracy of the results. Better meshing techniques will also be beneficial in future years in the development of new or more cars. It will enable a quick turnaround time on simulations allowing simulations to be done on more shapes to help best optimize the final shape. The electrical team has made excellent progress in training new members to design and build the core electrical systems of the vehicle. Battery protection systems, power distribution systems, dashboard and ancillary systems, and telemetry systems are all well under way. Many members now know how to design and lay out circuit boards, solder surface-mount components, and/or upload embedded code to boards. We are currently working on building up a benchtop CANbus, which will very closely emulate the functions of the actual car electrical system when finished. This system is intended to be a drop-in electrical system for after the main body of the vehicle is constructed. Within the electrical team the ancillary team has been hard at work designing the system that the driver interacts with. They have been working on the lighting system, cruise control, the horn and the controls for these systems. Much of the first semester was spent determining the parts needed and training members on the systems we would be using. We have received those parts and are very excited to test them out. During the break they will be finishing up the design of the printed circuit boards and the programming required to control them. Coming next semester, they will be able to have the boards fabricated, soldered and tested. The solar team has been working on encapsulation testing and the preparation of various tools. The team has conducted four encapsulation tests at temperatures around 95 degrees Celsius with extra applied pressure for about one hour. The results were close to perfect, there were only a few small dimples on the surface and some visible dust particles. For future tests, the team plans to utilize the clean room in the ECE building prior to heating in the OpenLab. The team has been granted access to the clean room. However, they are still waiting for the soldering tools and fume collector to be approved. The team has also etched the alignment tool out of acrylic and built the testing equptment for the solar cells. These will be used for building the array and characterizing the performance of each array. Below are two pictures of the testing equipment. A special thank you to the CALSOL team for donating solar backing sheet to us! Next semester we will continue to work hard to reach out goal of competing in the 2016 American Solar Challenge. We would like to thank all of our sponsors for their generous support! Without them we could not be making all of this progress! We would also like to wish everyone a Happy Holidays! If you would like to receive updates from the Illini Solar Car team via email you can join our mailing list here.